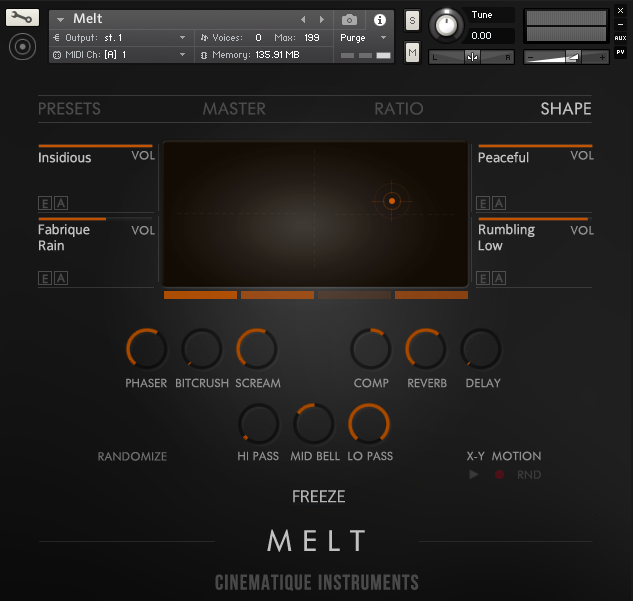 MELT is a fascinating instrument that allows you to create highly complex sounds, ambiances and textures in an extremely easy way. You are able to blend between 4 of MELT's beautifully varied and inspiring sound sources and thus create unique, interesting and inspiring sounds. MELT´s sound sources come from different areas, which are named Pure, Floating, Organic, Field Recording and Granular. In summary it is a complex arsenal of sounds and sources which provides on the one hand numerous sounds and instruments of our own library such as organs, synths, e-pianos, pads and resampled sounds of the legendary downbeat box and on the other hand specially processed sounds, field recordings and finally sounds created by granular synthesis and freeze functions. This collection is already unique, but in the mixture among each other it results in highly complex, novel and interesting sound structures. MELT is based on an XY pad - each of the 4 corners can be loaded with a separate sound source/ layer, which can be individually shaped by 9 different effects such as filters, distortion, phaser, reverb and delay. By moving the cursor inside this XY pad, MELT calculates its main sound out of this cursor position by the ratios of all four sounds and their individual effect paramaters. This may all sound a bit technical and complicated, but believe us it isn't! MELT does the whole calculation for you. You can just focus on playing along and move the cursor at your own requirements and thus create complex and dynamic sounds and ambiances in the twinkling of an eye. It is pure fun. 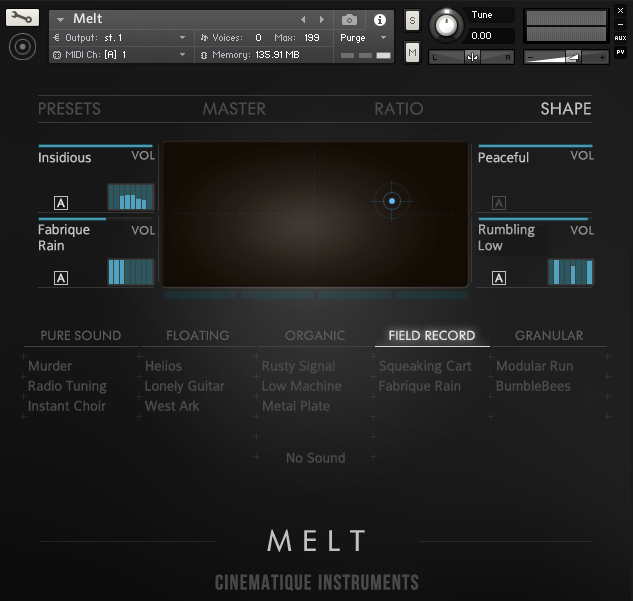 But besides "regular" sustained playing MELT provides a 8-step sequencer per sound/ layer. By activating, MELT is able to morph sustained notes with sequencer or even morph between 4 different kinds of sequencers types. This astonishing feature can result into polyrhythmical sounds. As you can see, the possibilities of MELT are almost infinite. Finally, MELT´s XY pad cursor motions can be recorded either as a loop within MELT or within the track of your selected DAW. Or you just let it randomly run. 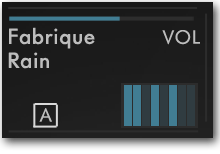 If you prefer to globally shape the sound of all 4 sounds at the same time, just activate the Freeze button. MELT now changes to a blue look and you are now able to control all the 9 effect parameters globally for all 4 sound sources/ layer at once. 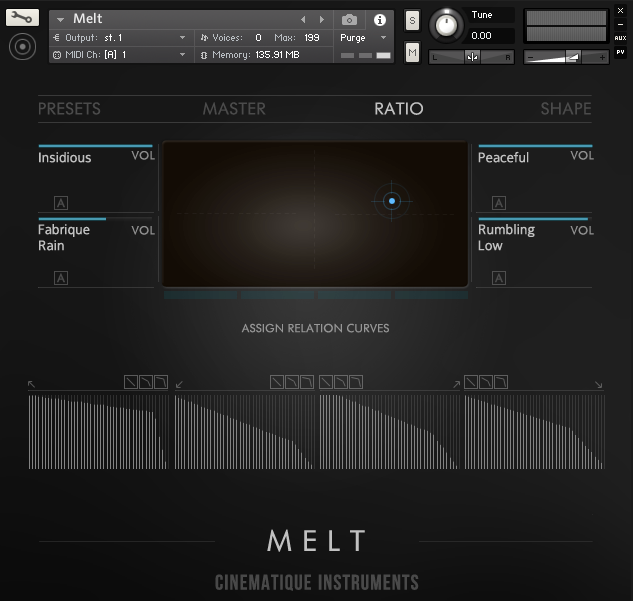 If you like to play around with MELT in the beginning, MELT provides over 120 "presets". Here you find a wide variety of categories and styles. Starting with simple surfaces, ambiances and textures, short and rhythmic sounds as well as organic strings sounds, experimental sound structures and complex textures are provided. Melt is absolutely ingenious. Its sound sources are beautifully diverse and inspiring. The ability to blend between 4 layers makes created texturally rich material surprisingly simple and enjoyable. A must have in my book! One complex patch including 64 sounds and about 120 presets. Approx. data 0.7 GB compressed data. For more details please read the reference manual. Playing along with an organic string patch. Playing along with a granular sequenced elektro patch!